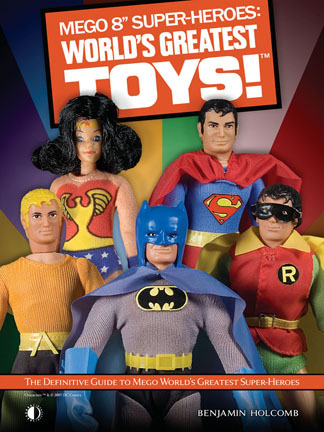 In our new catalog, you may have seen listed a book called Mego 8″ Super-Heroes: World’s Greatest Toys! This is one stunning, full-color book, already being hailed by such pros as Brad Meltzer and Chip Kidd for its graphic design, and obsessive coverage of the Mego toy line of the 1970s and â€™80s. Remember our Captain Action book of a few years ago? Picture it on steroids, and you’ve got it! However, in our new catalog, we have a typo on the price. The retail price is $49.95 for this hardcover ($54 postpaid in the US). Just wanted to get the word out; it should be listed correctly in Previews when it ships this Fall. This entry was posted in TNT on 28 February 2007 by Mr. Morrow.